The Prime Minister’s surprise move to swiften procedures for the presidential election, with a first round of voting set for December 17, will disrupt dealings with the troika until after Christmas, when the national economy’s heavy issues are taken on again. For the energy sector, it promises to be quite the opposite over the next few weeks, except for IPTO, Greece’s Independent Power Transmission Operator, whose privatization procedure will need to be reexamined and rescheduled. Foreign investors cannot be expected to submit any binding offers amid the country’s current political climate. A series of pending issues, such as the transferal of the responsibility to collect various electricity bill surcharges – like the Emission Reduction Tariff (ETMEAR), which finance the renewable energy sources (RES) special account – from IPTO to LAGIE, the Electricity Market Operator, add further obstacles to the privatization process at IPTO. Subsequently, the process will be put on hold for a few weeks, until the political climate has cleared up. However, snap general elections, should Parliament’s political parties fail to elect a new president, a ceremonial position, would further delay IPTO’s sale. Unlike IPTO’s entanglement with the country’s political developments, the progress of three other energy-sector fronts – gas market reforms bill, CAT (Capacity Availability Tickets) revisions, and preparations for NOME-type auctions – can be expected to accelerate. Sources said the gas market’s draft bill will be submitted to Parliament within the current week. Parliamentary regulations do not permit disruptions to ratification procedures should the house also be engaged with preliminary work for the election of a new President. Besides leading to the gas market’s liberalization, the gas reforms bill is also linked to a number of other important social and business-sector issues, such as a revision facilitating independently controlled flat heating within apartment blocks, and ETMEAR payment procedures for self-producers equipped with roof-mounted photovoltaic facilities. This latter revision stands as a prerequisite for a ministerial decision on net metering, which enables electricity consumers who generate their own power from an eligible on-site facility to offset the electric energy provided by a utility during an applicable billing period. The coalition’s postponement of negotiations with the troika until after the presidential election will not stop the former’s dealings with the troika’s technical teams for a solution to the country’s new CATs and NOME-type auctions. A gap exists between the negotiating sides on both issues. As disclosed by energypress, the Greek coalition forwarded its latest capacity Assurance Mechanism plan, which includes the CATs, to its creditor representatives last Friday, adjusting it to troika demands. It will be based on a mechanism compensating capacity flexibility, worth 327 million euros. All privately run production units will receive CATs, while hydropower units will also be incorporated, according to the proposal. PPC, the Public Power Corporation, will be distributed 55 percent of CATs on offer and private producers the other 45 percent. As for the NOME-type auction, sources contend Greek officials will insist on a model already proposed, based on detailed studies conducted by RAE, Regulatory Authority for Energy, to be used as support in negotiations with the troika. 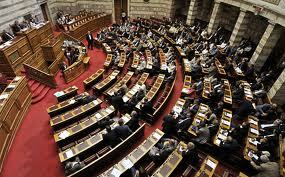 According to the Greek Constitution, if a presidential candidate does not draw 200 votes in the 300-seat house’s first round, then a second vote follows five days later. If this fails to produce a result, then a third round is held with 180 votes needed for the election of a candidate. Should the third round also prove unsuccessful, snap general elections will follow a month later.